There was a lot of hand wringing earlier this week on whether the Cyprus bailout was a template for future EU bailouts. When a bank fails and has to be seized by the government, uninsured depositors can lose some or all of their money. This has to be expected by anyone with money in excess of the insurance limit. And, senior unsecured and junior bondholders could easily find themselves holding worthless paper. That is how the system is supposed to work. Taxpayers are not supposed to bailout bond owners and uninsured deposits in a bank failure. That is the normal template for dealing with this kind of situation. The template should not be the seizure of insured bank deposits or the bailing out of bondholders and uninsured deposits by the government directly or indirectly by the taxpayers. I read a number of stories where citizens were interviewed by the reporter. The citizens blamed the EU for the failure of the two Cypriot banks, rather than the banks themselves or the government for its lax oversight. A deep recession is unavoidable in Cyprus. Billions of Euros have already left Cyprus, even with banking controls, as noted in this Reuters article. The reliance on banking as a source of growth is kaput, as one of the two Cypriot banks will be liquidated and the other will likely be downsized in the coming years. The Case-Shiller home price index for the 20 largest metropolitan areas rose 8.1% in January year-over-year, the largest annual increase since June 2006. All 20 housing markets showed annual gains. This index is a leading indicator for nonresidential construction activity with a 9-12 month lag period. The Census Bureau released its household debt report last week. In 2011, 31% of U.S. households had no debt. The level of debt free households in 2000 was 26%. ‎www.census.gov.pdf Those folks are the backbone of what I call the Saving Class. In 2011, secured debt, which includes debt against one's primary residence and automobiles, accounted for 89% of all household debt. Home debt accounted for 78% of all secured debt. The percentage of households having credit card debt decreased from 51% in 2000 to 38% in 2011. FedEx reported last Wednesday that its third fiscal quarter earnings declined to $361M or $1.13 a share from $521M or $1.65 per share in the year ago period. Excluding costs associated with an employee buyout program, earnings were at $1.23 on a 4% increase in revenues to $11B. The consensus estimate was for $1.38. FedEx also reduced guidance for its fiscal 4th quarter to $1.9 to $2.1 per share. SEC Filed Press Release The stock declined $7.44 or 6.89% in response to that report (3/20/13). Oracle reported that its fiscal third quarter revenues declined 1% to $9B, with new software licenses and cloud software subscriptions falling 2% to $2.3B. Hardware sales fell 23%. In response to this report, the stock declined 9.68% last Thursday, ORCL: 32.30 -3.47 (-9.69%), and another $.32 per share on Friday. Those reports taken in tandem caused the OG to hyperventilate, but the overall market shrugged these reports off. Markit PMI Data Europe and U.S.
After the indecisive election in Italy, the political parties have been unable to agree on a governing alliance. The leader of the Italian Democratic Party, Pier Luigi Bersani, said today that only an insane person would want to govern Italy which he called a "mess". The FED lowered its inflation prediction range for 2013 slightly from its December forecast. The new range is for PCE inflation at 1.3 to 1.7 in 2013; 1.5% to 2% in 2014 and 1.7% to 2% in 2015. Real GDP is estimated at 2.3 to 2.8 in 2013; 2.9 to 3.4 in 2014; and 2.9 to 3.7 in 2015. If the inflation predictions prove to be prescient, it would turn out to be a relatively benign environment for both stocks and bonds. If both the inflation and real GDP forecasts prove prescient, then that would be an optimal environment for stocks, particularly in relation to the low yields offered by bonds. 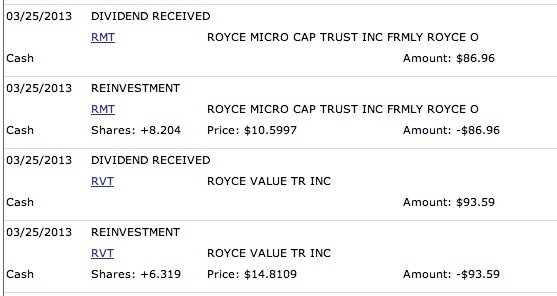 I am continuing to reinvest the quarterly dividends paid by the two Royce closed end funds that I currently own. Royce Micro-Cap Trust (RMT) and Royce Value Trust (RVT). I am a long term holder of both funds. To satisfy my urge to take profits, I will occasionally buy a third Royce CEF, Royce Focus Trust (FUND), and then sell those shares on a pop. Bought 200 of the Stock CEF FUND at $6.34-Sold 207+ FUND at $7.28; RB Bought 300 of the CEF FUND at $6.22-Sold: 300 FUND @ $7.2. The Royce Value Trust paid a $.19 per share quarterly dividend. 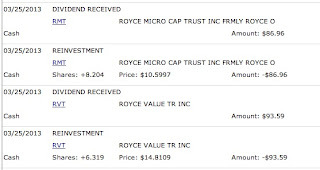 The Royce Micro-Cap Trust paid a $.13 per share quarterly dividend. Embarq was acquired by CTL: CTL Acquires Embarq. The Embarq bond matures in 2036 and has a higher coupon at 7.995% than the TC at 7.1%. That means there is less than a $1000 par value bond behind each $1,000 par value in trust certificates. The call warrant owner did not exercise their call option. Thereafter, the trustee distributed to the owners of the TC FJA 2 Embarq bonds and $305.75 in cash for every 100 shares. An owner of 100 shares did not receive $500, the difference between the par value of two bonds and the $2,500 par value of 100 FJA shares, due to the lower number of bonds owned by the trust as mentioned above. Lexington Realty Trust will be redeeming its 7.55% Series D cumulative preferred stock at its $25 par value plus accrued dividends. Lexington recently sold 20 million shares at $11.7. During the Near Depression period, I was able to buy this security at $6.60 and at $7. 1. Bought 100 NGD at $9.39 (The $500 to $1,000 Flyers Basket Strategy)(see Disclaimer): NGD is a gold miner. I view the purchase of any gold mining stock to be highly speculative and consequently limit my risk to insignificant sums by placing this stock in my Flyers Basket Strategy. The Mesquite mine is located in Arizona. Mesquite That mine produced 142,000 ounces of gold in 2012. Mesquite commenced operations in 2008. The Peak mine is located in Australia. Peak Mines That mine produced 96,000 ounces of gold and 14,000 ounces of silver in 2012. New Gold Operations Peak commenced operations in 1992. Part of the long term debt consists of $300M in face value of 7% senior unsecured notes due in 2020 and $500M of of senior unsecured notes due in 2022. For the 2012 4th quarter, NGD reported adjusted earnings per share of $.11 on $250.9M in revenues, up from $177.3 million in the 2011 4th quarter. Gold production during the quarter was 112,883 ounces. Earnings from mine operations were reported at $99.2M. Net cash generated from operations was $106M. Copper production increased by 236% in 2012 due to the start up of production at New Afton and a 13% increase in copper production at the Peak mine. Copper production for the 2012 4th quarter was reported at 20.9M pounds with an average selling price per pound of $3.52. The company also discusses two developmental projects in this press release. One is El Morro located in Chile, with NGD having a 30% interest and Goldcorp being the other owner. In 2013, New Gold estimates that it will produce 440,000 to 480,000 ounces of gold at a cash cost of $265 to $285 per ounce. Rationale: (1) Reasonable Upside Potential Assuming Gold-Silver Prices Stabilize and Turn Up. While NGD is a low cost producer, profitability still hinges on the unpredictable gold and silver prices. Hopefully, gold and silver prices will stabilize around current levels and start to trend back up. If gold can move back over $1750 an ounce, it would be rationale to predict a return to the September 2012 price for NGD stock, somewhere in the $12 to $13 range. If the price continues to fall, I may become an involuntary long term holder of this stock. A disadvantage is a lack of a dividend. Several gold mining companies have over 2% dividend yields at current prices. If NGD is successful in lowering more its already favorable "all in" costs numbers, then it consequently has less of a profit risk, due to a decline in gold price, than other miners with much higher all-in costs who could see there profits disappear with a significant decline. As noted in this Kitco News item, Barclays expects that the 12 year rally in gold will end this year. The main culprit in Barclays opinion is selling in Gold ETFs, but an acceleration of the decline in jewelry demand and a "steep slowdown" in central bank buying will contribute to gold's problems. In another Kitco News item, Societe Generale predicted gold would fall to $1,400 an ounce by year end. No one really knows of course. The price goes down a few hundred bucks and the "analysts" and other card carrying herd members and fellow travelers turn bearish. Demand and price can turn on a dime, up or further down. Future Buys/Sells: I would likely be a seller in the $13 to $15 range. I am not going to buy more shares until I sell the first 100 share lot at a profit. I would possibly buy back that 100 share lot when and if the price declined below $9, provided there is no material adverse development. 2. Sold 352+ of the Stock CEF ETW at $11.173 (see Disclaimer): The gain on this one was largely due to return of capital adjustments. As noted in the big picture synopsis section, I have turned negative in my short term stock outlook, and that negativity was reinforced with some recent earnings reports and European data, discussed in the introduction section above. I will frequently move into and out of stock CEFs and ETFs as a way to adjust my overall stock allocation. The disposition of my ETW shares was a very minor adjustment to my stock allocation. I still have similar positions in two other Eaton Vance buy-write CEFs: Eaton Vance Tax-Managed Global Diversified Equity Income Fund (EXG) (436+ shares in IRAs) and Eaton Vance Enhanced Equity Income Fund (EOI) (405+ Shares). Both of those funds pay monthly dividends. 3. Sold 50 Vale at $17.15 (Stocks, Bonds & Politics: The $500 to $1,000 Flyers Basket Strategy)(see Disclaimer): I bought these shares last August: Bought 50 Vale at $15.9 I discussed in that post several potential negative factors, and those issues are still around. I can not spend much time monitoring the small positions in my LT and Flyer's Basket Strategies. After reviewing several recent reports and news items, I have turned negative on Vale. Over the weekend, I decided to look at Vale again after reading a negative story about iron ore prices in "The Trader" column in this week's Barrons.com. 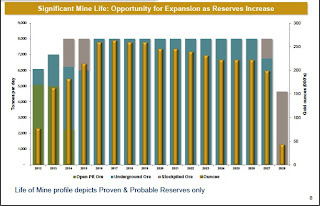 The article mentioned that a supply glut is developing with new mines, while demand from China is expected to slowdown. Needless to say, decreasing demand and increasing supply for any product spell trouble for the price. A similar article about a possible crash in iron ore prices was published by Forbes. China is also increasing its ability to recycle steel and to increase its ore supplies. And, that lower demand is occurring at a time when substantial new iron ore projects will soon be contributing to supply, primarily in Australia. The Goldman Sachs analyst claims that those new projects are past the point of cancellation. Another negative for Vale is the recent cancellation of work at its Rio Colorado potash project in Argentina, Reuters, where it had spent about $2.2B through 2012. Vale needs to diversify, so the cancellation of this project after substantial expenditures is a major negative. Morningstar currently has a 3 star rating on VALE and a consider to buy target of $11.4 or less. If the supply glut turns out to be accurate, and given the dependency of Vale on iron ore sales (about 70% and 90% of EBITDA), I would not be surprised to see a price lower than $10. 4. Added 50 of the Balanced ETF GYLD at $26.73 (see Disclaimer): This brings me up to 150 shares of this world balanced ETF. Dividends are paid monthly which is always viewed positively. The expense ratio is high at .75%. 5. Bought 100 of the Bond CEF GDO at $19.95 (see Disclaimer): The bond CEF Western Asset Global Corp Defined Opportunity Fund (GDO) has been bought and sold numerous times. At one time, I owned close to 1,000 shares. With this last purchase, I am back to owning just 100 shares. I ran out of good alternatives for income generation more than two years ago. 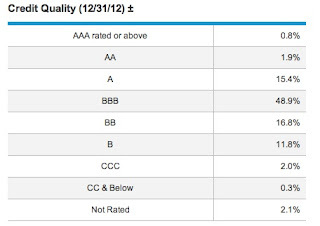 At least this bond CEF gives me a diversified worldwide bond portfolio and a current yield over 7%. Security Description: Unlike most bond funds, GDO has a term date. GDO page at CEFConnect. This is a new link that I am providing for CEFs. Some readers may prefer it to the Closed End Fund Association site. The fund had 249 holdings as of 12/31/12 with an average effective duration of 4.29 years. 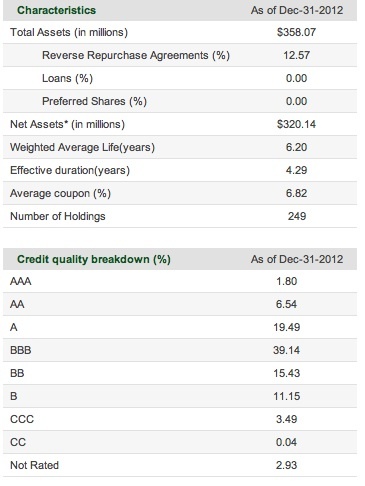 The fund was using a modest degree of leverage as of 12/31/12 as shown above under "reverse repurchase agreements". Generally, I would anticipate that a bond with a duration of five years will rise 5% with a one percent decline in rates and decline by 5% with a 1% rise in rates. Dividends are paid monthly. When I first purchased shares in 2010, the monthly dividend was $.13 per share. Now, it is $.12. GDO Monthly Distributions I would anticipate that the dividend rate will continue to trend down, particularly when more higher yielding securities mature and the fund is faced with non-optimal reinvestment options in the current abnormally low interest rate environment. The last trade yielded a $340.33 profit for shares purchased in December 2010. Rationale: (1) I must be addicted to this security since I am unable to stay away for long after liquidating my position. As mentioned above, I would anticipate that the dividend rate will gradually decline and that decline will likely accelerate as the fund nears its 2024 liquidation date, as the managers shorten the duration. I tested the Google search box with a few inquiries and it appears to be running normally again. I have for now restored that search box in the upper right hand corner of the blog. If anyone conducts a search, and receives inadequate results, please let me know. I am updating the tables for the Lottery Ticket Basket and the Regional Bank Basket Strategies on the last Monday of each month. The prices shown in the following tables are from last Friday. My basket strategies will have a large number of securities in them. The focus is on the overall return of the basket rather than on any component. After experiencing some success with this strategy, I now have a requirement that my total investment in all LT holdings can not exceed my total realized gains for this basket strategy. My total exposure is currently under $8,000. 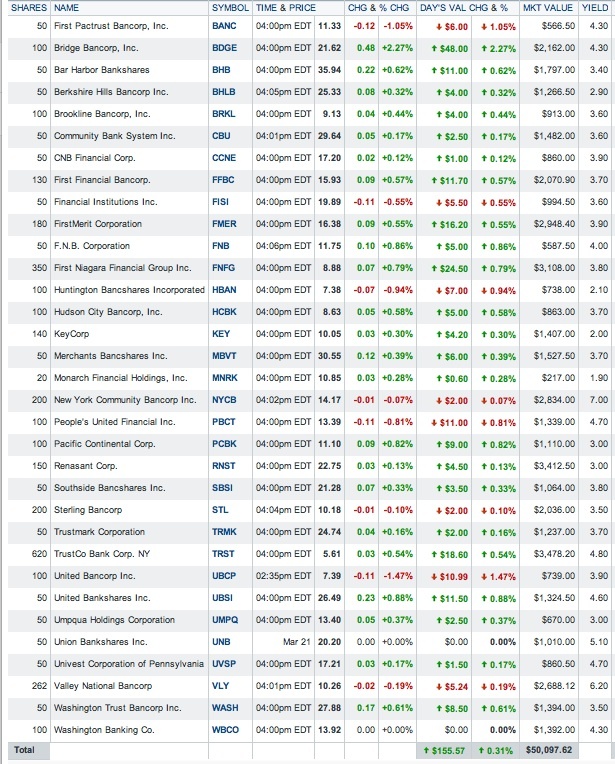 As of 3/22/13, the largest unrealized gains include Datalink at +52.65%; Forest City at +47.32%; Alumina at +35.64%; Susquehanna at +34.54%; BNC Bancorp at +34.32%; National Penn at +31.93%; and Qlogic at +30%. I sold last month several gainers that were discussed in the last update. Those gains are now included in the realized gain total, increasing that amount by $430+. Stocks, Bonds & Politics: Updated Tables Regional Bank Basket Strategy and Lottery Ticket Basket Strategy/Lottery Ticket Sales: 50 TTI at $9.97, 50 RRST at $7.78, 30 SMA at $10.81, 40 BRKS at $9.71/Bought 50 BANC at $11.3 (2/25/13 Post). I promoted KeyCorp and Huntington from the LT Basket to the Regional Bank Basket a few weeks ago. The LT purchases of KEY and HBAN are now included in the regional bank basket table. The leading LT loser is Velti at -75.39%. Sutor is my remaining Chinese micro cap after I realized a 100+% gain on XIN, discussed below. For whatever it is worth, Zacks recently upgraded Sutor to a strong buy. I am down about 33% on that one. I still consider SUTR to be a Lottery Ticket and have no interest in adding to my negligible LT position. Given the small amount of money devoted to each selection, I can hold my losers forever, assuming the company can stay out of bankruptcy, and I have had many come back from steep losses. The shares continued to move up on 2/28/13, a down day for the market: XIN: $5.47 +0.45 (+8.96%). That rise put my unrealized gain over 100%. This article at Seeking Alpha discusses the earnings report. I left a comment to that article which did not say much. Another reader left some comments with links to videos about China's ghost towns. I had watched one of those about two years ago. He also mentioned that 60 minutes was about to run a story about the bubble in China's housing market and the ghost towns. I then went to CBS and watched the promo for the show. He was right so I decided to jettison the XIN position. This is a link to the 60 minutes program that aired that Sunday: China's real estate bubble - 60 Minutes A transcript of this broadcast can be found at CBS News. The speculative building in China surpasses by far anything previously seen in history. Whole cities are being built with few inhabitants, empty malls and multi-lane highways with no traffic at rush hour. The apartments are being sold to middle class families who are buying them for "investments", frequently using their life savings to make a purchase. In an interview with CNBC, Jim Chanos highlighted the 60 minutes story to justify his short positions in companies related to China's construction. XIN is diversifying its real estate holdings by buying land in the U.S. The issue raised by the 60 minutes program is far broader than the valuation of China's real estate companies. Would any investor accept U.S. GDP numbers if those numbers were materially influenced by ghost towns being built in Kansas and Nebraska? China's GDP needs to be adjusted down for the expenditures on these projects. (B) Ferro: A. Schulman offered to acquire Ferro for $6.5 per share, half in cash and half in Schulman shares (SHLM) The offer was based on publicly available information and "could be adjusted" after due diligence. Ferro rejected the offer. After Schulman announced its offer and Ferro's rejection, Ferro reported another dismal earnings report. Headknocker noted that the surge was good since it took him back into profit territory by a couple of bucks, which is better than being kicked in the groin, but would have preferred for Right Brain to buy the shares at $2.38, the 52 week low reached intra-day on 11/16/12 (FOE Historical Prices) and wonders why the RB failed to buy the shares at that moment in time. "You win some, you lose some, get over it," a voice was heard to say. I was slightly intrigued by this leveraged micro cap after seeing a news story that Prospect Capital had participated in its recapitalization. I own PSEC, a Business Development Company and have it listed in a Yahoo Finance portfolio of "main" positions which has over 200 names in it. I currently own 478+ PSEC shares with 100 of those owned in the ROTH IRA. 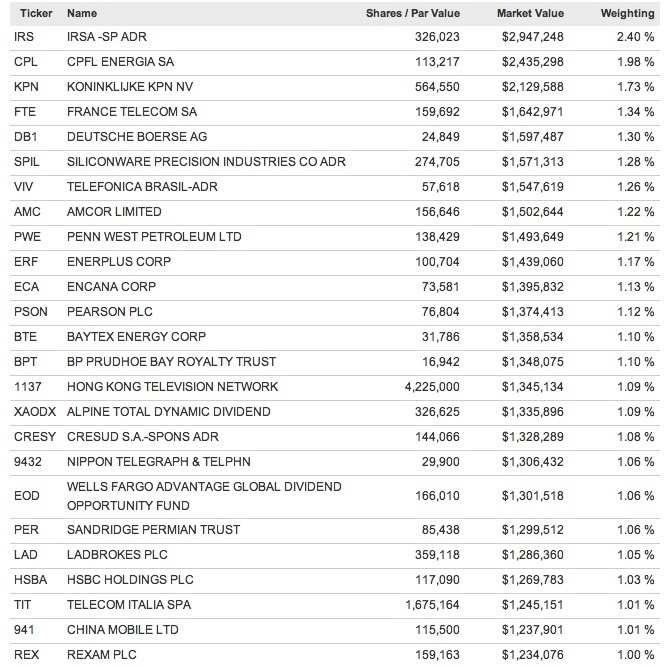 Anyway, I open that portfolio several times a day and YF shows recent news stories about companies in that list. I noticed this story filed under PSEC in that list. Prospect Capital Provides a $70 Million Term Loan to Support the Recapitalization of Cinedigm. I then decided to check out Cinedigm Digital Cinema (CIDM) in more detail. This was an usual way for me to find a LT selection. Usually, I use stock screens to find companies unknown to me. Some selections are well known and have just fallen on hard times. For lottery ticket purchases, I am not going to spend much time investigating a possible purchase, when the maximum exposure is $300 plus any prior realized gains. CIDM claims to be a leader in the digital entertainment revolution with its "pioneering digital cinema deployment and servicing efforts, and the state-of-the-art distribution and exhibition software". The company also has a library of over 18,000 movies and television episodes (documentaries, low budget independent films, etc). I then read a very long and detailed stock report on this company published by Seeking Alpha. I would simply refer anyone interested to that article. My next stop was a review of the last earnings call transcript published by Seeking Alpha. Lastly, I read the earnings press release for the last quarter, CIDM's fiscal third quarter ending 12/31/12: SEC Filed Press Release Revenues rose 17% to $23.2 million with a loss per share of $.03, down from a ten cent loss per share in the year ago quarter. CIDM's total domestic digital screen deployment totaled 11,697 with 269 exhibitors, with 835 screens installed in the fiscal third quarter. For this line of business, the expansion opportunities appear to be overseas. The company also releases two low budget films theatrically during the quarter, and distributed 2830 hours of film and digital content to "more than 22 digital partners". The company is highly leveraged for its size and existing revenue streams. There is also always the possibility of a competitor emerging with better products and/or lower cost services. The company is not yet profitable but is at least moving in the direction of profitability. All of those risks suggested to me that this position had to be, for now, categorized as a Lottery Ticket. D. Bought 40 AuRico Gold (AUQ) at $6.55 (see Disclaimer): I am near the end of my gold mining stock purchases. All of those purchases will be assigned to my high risk Lottery Ticket and Flyers strategies which by definition severely limits my monetary exposure. AuRico Gold sold its Ocampo mine for $750M last December and bought back $300 million in common shares earlier this year. During the 4th quarter, the company produced 41,146 ounces of gold and anticipates 2013 production from its Young Davidson and El Chanate (Mexico) to be between 190,000 to 220,000 ounces. The operating cash cost is estimated to be between $540-$620 per ounce. The "all-in" cash costs is estimated to be between $1,100 to $1,200 per ounce. The company defines "all-in" costs to include "cash costs, sustaining capital, corporate general and administrative expense and exploration expense". AuRico recently started to pay a quarterly dividend of $.04 per share. For whatever it is worth, AuRico was a Fred Hickey pick in the 2013 Barron's Roundtable. The price was then $8.08. He argues that "AuRico is one of the cheapest gold stocks you can find". The Young Davidson mine has a reserve life of 21 years, while El Chanate has about 7 years left. Hickey claims that there are upsides to both, and AuRico has a "potentially major project in British Columbia". The current consensus E.P.S. estimate is for $.39 in 2013. AUQ Analyst Estimates I would not pay much attention to that number given the volatility of the gold price. Price to book is shown at .8 at AUQ Key Statistics based on a $6.67 stock price and data as of 9/30/12. One reason for labeling AuRico a Lottery Ticket can be found in this article published by Motley Fool that criticizes the company for selling some mines. Another reason is its relatively high all-in costs compared to other miners recently purchased as part of the Flyer's strategy, including one that will be discussed in the next post which has dramatically lower all-in costs and was consequently bought as part of the Flyer's Basket Strategy. E. SuperValue (SVU): SUPERVALU completed the sale of Albertsons, Aceme, Jewel-Osco, Shaw's and Star Market Stores to a Cerberus led consortium. The consideration for the sale was the assumption of $3.2B in debt plus $100M in cash. Symphony Investors, another Cerberus led consortium, bought 42+M in newly issued SVU shares at $4 and completed a tender offer for another 11+M shares at $4. Symphony is now SVU's largest shareholder, owning approximately 21.2% of the outstanding stock. What is left? SVU still owns over 1,300 Save-A-Lot stores and has a large wholesale grocery business that sells to over 2,000 independent retailers. In my opinion, SVU is a better company now after shedding that $3.2B in debt, the capital infusion and the Albertson stores divestiture. The primary reason for its problems was the debt financed acquisition of Albertsons. I am not tracking reinvested dividends in this table. 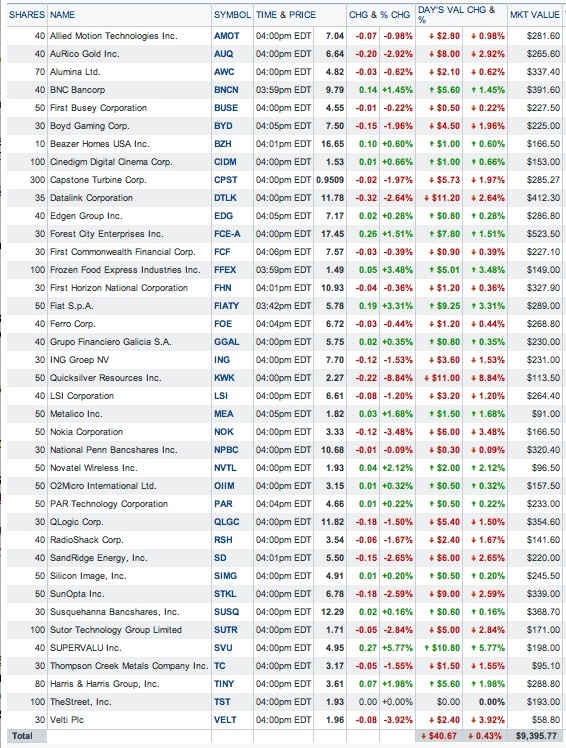 The dividend yield showed in this table is calculated by Yahoo Finance based on last Friday's close. My dividend yield for each position will be different based on my total cost numbers. In most cases, with FNFG and VLY being notable exceptions, my dividend yield will be higher. Over the life of this basket strategy, I anticipate that the dividends will provide 40% to 50% of the total return. I am generally keeping my total exposure between $40,000 to $50,000. I did not have any additions since my last update. The unrealized total gain is more than $4,600+. A. Sold 100 MNRK at $10.59 (see Disclaimer): Left Brain feels obligated to disclose that the Old Geezer, confused, muddled and addled as usual, barely able to form a coherent though except by accident or the grace of God, thought that he entered an order to sell Headknocker's entire position in Monarch Financial. The OG had forgot that the stock had undergone a 6 for 5 stock split soon after he purchased 100 shares, which left Our Dear Leader Headknocker with 120 shares, not 100. So now our Great Leader owns 20 shares of Monarch Financial (MNRK). 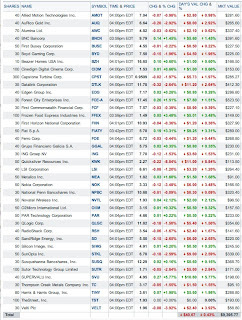 I bought these shares last November and realized a gain of $186.06, or roughly 21.5% on the shares. Profit taking was one motive. Another involves dividend yield. A key aspect of the regional bank basket strategy is to generate dividend income. MNRK's current dividend yield at a $10.59 price is less than 2%. The valuation is reasonable based on estimated 2013 and 2014 earnings at the current price. MNRK Analyst Estimates I may keep the other 20 shares for awhile, just to see whether I can sell at over $11.5 which would more than pay for another brokerage commission. The OG added that the foregoing may have been his plan all along, but doesn't remember. B. Huntington (HBAN) and KeyCorp (KEY (both owned): Both Huntington Bancshares and KeyCorp received no objection from the Federal Reserve to their capital action plans. Both passed the stress test. KeyCorp raised its dividend to $.055, and its Board authorized the purchase of up to $426M in stock. Huntington raised its quarterly dividend by 25% to $.05 per share, and its Board authorized the purchase of up to $227 million in stock. Both HBAN and KEY were initially purchased as part of the Lottery Ticket Basket Strategy and later promoted to the Regional Bank Basket Strategy. C. Sold 51+ FIBK at $19.33-satellite taxable account (see Disclaimer): First Interstate BancSystem Inc. Cl A (FIBK) is the banking holding company for First Interstate Bank which has 72 branches in 42 communities in Montana, Wyoming and South Dakota. I decided to harvest my profit. I have been trading NYCB in my regular IRA while keeping the shares owned in a taxable account. With this last trade, I have realized a total gain of $403.09 in that account. I have also clipped several $.25 per share quarterly dividend payments. I still own 150 shares in a taxable account. Added 50 NYB at $12.79 (2/7/12 Post); Bought 50 NYB at $11.3 (October 2009 Post); and 50 shares at $11 in October 2009. 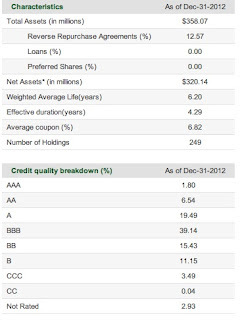 NYCB is currently rated 3 stars by Morningstar, down from a 4 star rating when I purchased shares in November. Their fair value estimate is $14. During my entire period of ownership dating back to October 2009, NYCB has paid a $.25 per share quarterly dividend, which was not cut during the last recession but has not been raised either, since the 2004 second quarter. New York Community Bancorp Dividend History The payout ratio is close to 90%. A recent negative article on NYCB published at Seeking Alpha did not influence my decision to sell 50 of my 200 shares. The CEO John Koelmel called this acquisition a "home run". A more appropriate baseball analogy would be a batter deliberately moving in front of a Nolan Ryan 100+ mile per hour fastball so that it would pop him in the groin. The Board has finally decided to replace Koelmel, showing him the door with a $5.4 million severance package. Failure is rewarded in America. The severance package was apparently a reward for the shares losing almost 1/2 of their value over the past three years. Ultimately, the Board is responsible for what has happened to FNFG's shareholders by approving the HSBC transaction, and all of the Board members who voted for that acquisition need to be fired also. A recent article published at TheStreet argues that FNFG shares "may be a strong turnaround investment" and "may be undervalued" after Koelmel got the boot. F. Washington Trust (WASH): Washington Trust Bancorp increased its quarterly dividend to $.25 per share from $.24, the third dividend increase over the past 12 months. I currently own 50 shares, part of the 100 share bought at $15.26. At a total cost of $15.26, the dividend yield based on a $.25 quarterly dividend would be 6.55% for the remaining 50 shares. If I was to lower that cost by the prior realized gain of $347.03, the yield becomes 12.02%. 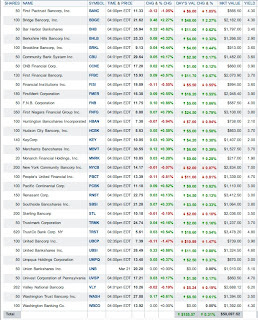 155+ Shares RNST Unrealized Gain as of 3/22/13=$1,260.83. Renasant is headquartered in Tupelo, Mississippi. As noted in Item # 4 RNST (Oct. 2012 Post), I had bought 50 shares at $13.85 in September 2011 with no write up (see snapshots). The Masters of Disaster have found a new way to force savers to pay for their mistakes. As a condition to receiving €10B for its troubled banks, the Cyprus President agreed with European finance ministers to levy a one time tax on bank deposits. The deal still has to be approved by the Cyprus Parliament. The proposed tax would be 6.75% on deposits under €100,000 and 9.9% over €100,000. According to Reuters, the Cyprus government is willing now to exempt accounts with less than €20,000, but would take 6.75% of amounts between €20,000 and €100,000 and 9.9% over €100,000. That structure would raise less than required by the EU and is unlikely to pass anyway according to Reuters. Based on a Bloomberg report published last night, three political parties including the communists have stated that they will oppose the bailout. If that is true, and those politicians remain steadfast in their disapproval, the government does not have enough votes to pass the bailout package which could lead to a collapse of the Cypriot banks. Levying a tax on deposits is certainly a more direct way for savers to recapitalize improvident financial institutions, compared to the indirect way of taking savers money adopted by the Federal Reserve in its ZIRP monetary policy. In both cases, innocent citizens are required to pay for the mistakes of others. Banks in Cyprus has been a bank haven for wealthy Russians due to lax banking laws. It has been widely reported that the banks were used for money laundering. As a result, Cyprus's banks had assets greater than 8 times the nation's GDP and deposits at approximately 4 times GDP. The two large Cypriot banks lost a great deal of money investing in Greek government bonds. Cyprus has a guarantee on deposits of up to €100,000. Is that guarantee worth anything without a bailout? Cypriot banks held about €30B in insured deposits and €35B in uninsured deposits. The EU finance ministers wanted Cyprus to raise €5.8B as a condition to securing the €10B from the EU and the IMF. The Cyprus President was willing to throw small depositors under the train in order to please Moscow. Cyprus was renegotiating a €2.5B loan from Russia. This approach is not likely to restore confidence in a banking system. It was not surprising to see gold rise yesterday, but I did expect more of a pop. After all, the signal sent by this latest development reinforces and rejuvenates gold bug fever and rational paranoia, in that it highlights and reinforces the following fears and concerns: (1) insured bank deposits are not really safe; (2) the government can tax just about anything, tangible or intangible, including a failure to act (e.g. individual mandate in Obamacare); (3) the power to tax can easily escalate into the power to destroy and to confiscate and then redistribute to others more favored; and (4) government guarantees can be withdrawn or changed in significant ways. Still, I do not see anything happening in Cyprus as having a long term impact, even though a potentially dangerous precedent has been established at least in Europe. In 2009, the EC made it clear that common shareholders and owners of junior debt would have to share the burden for any future state aid given to a particular company. (paragraph 26 at page 8 ec.europa.eu.pdf) This would be particularly important to the owners of hybrid securities whose distributions can be deferred once the common dividend is eliminated by the company. General Mills (owned) announced a 15% increase in its quarterly dividend, effective with the August 1, 2013 payment. The increase will be from the current $.33 per share to $.38. The next dividend will be $.33 and will be payable on 5/1/2013 to stockholders of record on 4/10/13. GIS has paid dividends without interruption or reduction for 114 consecutive years. ARMOUR Residential REIT cut its monthly dividend to $.07 from $.08. The seven cent monthly dividend was declared for the months of April, May and June. This is a link to a recent positive article about Armour published at Seeking Alpha. This is a link to a negative article written by an investor who has shorted the common stock. Seeking Alpha I published a response to this article. The FHA reported that 1.074M mortgages were refinanced in 2012 under the HARP program. fhfa.gov. Dec12RefiReport.pdf Since inception, there have been 2.165+M refinancings under that program. Consumer Prices increased sharply in February at .7% on a seasonally adjusted basis with a .9% rise in gasoline prices accounting for almost three-fourths of that rise. Core CPI rose .2%. The annual increase without seasonal adjustments rose to 2%. Intermediate and long term treasuries rose in price and fell in yields in response to this report. The ten year treasury closed at 2% yield last Friday. As of 3/15/13, the break-even on the 10 year TIP was 2.55%. A recent article published by MarketWatch highlights the increasing demand for natural gas. The Empire State Manufacturing general business conditions was reported at 9.2. Any number of zero indicates expansion. 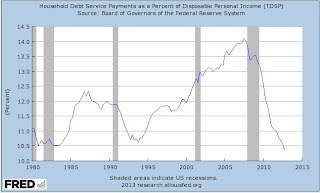 With lower debt service payments as a percent of disposable income, consumers have the capacity to save and/or to spend more of their disposable income. 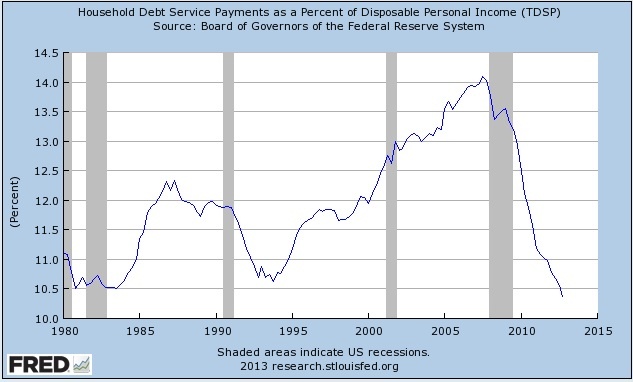 The Financial Obligations to Disposable Personal Income ratio (FOR) was reported by the FED at 13.6. That is the sixth lowest FOR ratio on record, and the lowest since the 1980 4th quarter. The FOR ratio adds automobile lease payments, rental payments on tenant-occupied property, homeowner's insurance and property tax payments to the debt service ratio. After the close yesterday, TICC commenced the offering of 3M common shares, plus an over allotment of an additional 450,000. TICC is a BDC and share offerings are a known hazard for owners of this type of company. The shares were priced at $10.2. 1. Bought 100 EGO at $9.30-Satellite Taxable Account (The $500 to $1,000 Flyers Basket Strategy) (see Disclaimer): EGO was bought last week. I mentioned near the end of my prior post that I would be discussing one other gold mining stock bought prior to the publication of that post. Like its predecessor in time, The Lottery Ticket Basket Strategy, the Flyers Basket Strategy is viewed as high risk. And, for investments with serious risks of capital losses, risk is controlled by severely limiting the amount of the investment, rather than to avoid the security altogether. Company Description: Eldorado Gold Corp. is a mid-tier gold company with mines located in Turkey, China, Greece, Brazil and Romania. I am primarily relying on a comprehensive report from Morningstar which currently has a 4 star rating on EGO and a $14 fair value estimate with a high uncertainty value. EGO Eldorado Gold Corp EGO is also assigned a "narrow moat". A five year chart reveals a high of $21.48 on 9/5/11, when the P.M. London gold fix was at $1,895 per ounce. Kitco Inc. - Past Historical London Fix On the day of my EGO purchase (3/11/13), the P.M. London Fix was $1,579, so the spot price of gold had declined about 16.68% between 9/5/11 to 3/11/13. EGO declined approximately 56.7% during that same time period. So, the stock qualifies now for purchase under my Flyers strategy. As noted in this Bloomberg article, a number of brokerage firms and hedge funds have turned negative on gold. After prices of anything goes down significantly, the Wall Street "analysts" will turn negative espousing numerous reasons why the decline will continue. And, after prices of anything goes up significantly, the "analysts" will turn positive, singing the praises of whatever it is that is going up in price. Those analysts are merely weather vanes, very astute in informing investors about the wind's direction rather than actually making a worthwhile weather forecast. Kitco reported yesterday that HSBC looks for gold to recover in 2013 and to average $1,700 an ounce during the year. An analyst interviewed the Gold Report, published by Seeking Alpha, had a positive comment about Eldorado. His version of all-in costs for the largest 13 gold miners is sitting near $1,600 an ounce. He is including in his cost estimate the costs associated with exploration and the building of new mines, some of the general and administrative expenses, operating cash costs, financing costs, and sustaining capital costs, all of which drain cash. Given the useful life of most new mines, the companies have a need to explore for and to build new mines just to stay in business long term. Generally, newer mines will have lower grades which are more expensive to mine, and that cost increase is frequently driven higher by the remote locations of many new mines. I thought that this article was worth reading for anyone investing in ("speculating in") gold mining stocks. Eldorado's main mine, which accounted for 40% of its gold production in 2011, is known as Kisladag located in Turkey. 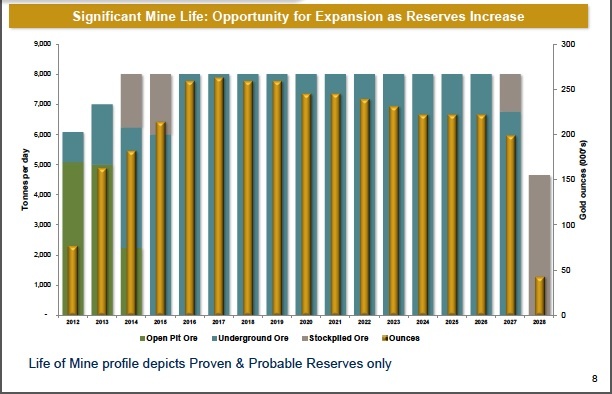 The mine is expected to last more than 3 decades at 2011 production levels. Another mine in Turkey, known as Efemcukuru, stated commercial production in December 2011 and is ramping up to full production. This mine is currently estimated to have less gold than Kisladag but will be lower cost due to higher grade ore. In February 2012, Eldorado purchased for $2.4 billion European Goldfields which had one mine in operation, Stratoni, in Greece but two other shovel ready projects in Greece known as Skouries and Olympus. Skouries is a copper/gold project. It was attacked by armed intruders in February who destroyed office trailers and mobile equipment. The European Goldfields purchase also brought into the EGO fold a late stage project in Romania known as the Certej gold project. In 2009, EGO acquired Sino Mines for $1.9B which brought into EGO's fold two mines in China, known as the Jinfeng and White Mountain, and a late stage project known as Eastern Dragon which is currently experiencing permit delays. In 2012, White Mountain had 80,869 ounces of gold production (cash costs=$625 per ounce):and Jinfeng had 107,854 ounces (cash costs=$817 per ounce) It is hard for me to see the accretive value in the Sino Mines acquisition unless Eastern Dragon overcomes its permit delays and proves to be a lower cost mine than the other two. Risks: Some of the risks are highlighted in some of the discussion above. There is a holdup in permitting for the Eastern Dragon mine in China. It may not have been a good idea to spend $1.9B to acquire mines in China. Greece has raised its corporate tax rate recently. There was also recently a large protest in a Greek town over a proposed EGO mine. Any purchase of a gold mining stock now is analogous to catching that proverbial falling knife. Anyone willing to catch the falling knife needs to be prepared to lose money. And, a substantial amount of their cash flow is eaten up with exploration and new mine development, a never ending cycle of keeping the company in business. I have a negative view of gold miners as investments, an opinion buttressed by EGO's share price decline since 9/5/11 noted above. Future Buys and Sells: I will not buy anymore shares until I successfully trade this 100 share lot profitably. My hope is to sell the stock north of $12 within 12 to 18 months. 2. Bought 200 of the Bond CEF BTZ at $13.96-Regular IRA (see Disclaimer): BlackRock Credit Allocation Income Trust (BTZ) is a leveraged closed end bond fund. I intend to sell my BTZ position held in a taxable account soon. I took a snapshot of that position shortly after buying 200 shares in the regular IRA on 3/13/13. I am basically transferring this bond CEF position from a taxable account to an IRA. The general idea will be to collect several monthly dividends and then hopefully exit the position without a loss within the next 12 months. I am in a trading mode for leveraged closed end bond funds. BTZ was ex dividend on 3/13/13, the day after my purchase. The current monthly distribution rate is $.0785 per share. Distribution Dates and Amounts Announced for Certain BlackRock Closed-End Funds At that rate, the yield at a total cost of $13.96 would be about 6.75%. On 3/12/13, this security had declined by seven cents, while major bond indexes were increasing slightly in price. I therefore anticipated a slight rise in the net asset value per share and an increase in the discount to net asset value which was already high for a bond fund. Prior Trades: I am just content to collect some dividends and to hopefully exit the position without losing any money on the shares. I may be pushing my luck with this last purchase. Leveraged bond funds are something that I do not want to own when interest rates start to go up in a meaningful way. I also recently bough 100 shares in the Roth IRA: Item # 2 Pared Trade: Sold 100 GDO at $20.79 and Bought 100 BTZ at $13.83 (December 2012) I noted in that post that the shares closed that day with a net asset value per share of $15.32 and at a -9.73% discount. It is more time consuming finding prior posts on a subject after the google search box quit working. I did find some prior discussions about BTZ: Item # 2 Added 50 BTZ at $11.24 (Oct. 2011); Item # 1 Bought 100 BTZ at $11.90 (September 2011); Item # 5 Bought BTZ at $11.45 in the Roth. Rationale: (1) I am simply attempting to generate some income in a retirement account when money market funds are hugging zero yields. The trick will be to exit the position before interest rates can do material damage to the fund's performance. As with all CEFs, it is possible for the fund's net asset value per share to increase with the price remaining about the same or even going lower, which causes the discount to widen. The ideal situation for my exit strategy would be a steady or rising net asset value coupled with some narrowing of the discount to net asset value from 9.18%. Future Buys/Sells: As noted above, I intend to sell the 222+ shares owned in a taxable account soon as I transition that position to the regular IRA. Security Description: The Guggenheim International Multi-Asset Income ETF (HGI) seeks to replicate, before fund fees and expenses, the Zacks International Multi-Asset Income Index. Distributions are paid quarterly at a variable rate. Based on the 2012 distributions totaling $.772 per share, the yield at a total cost of $17.53 would be about 4.12%. The fund currently has a 4 star rating by Morningstar. Rationale: The income generation is okay for a stock fund, and there is some appreciation potential. Some of the international markets have lagged the performance of the U.S. stock market. Risks: The normal risks for a stock ETF that invests in international companies. The value and income tilt of this fund mitigates some of those risks. The expense ratio is viewed as high for an ETF. 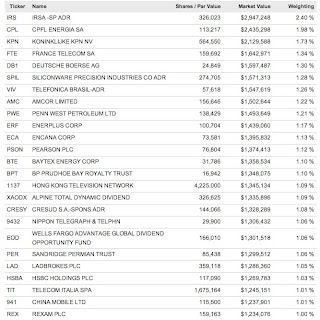 Future Buys and Sells: I will periodically buy and sell shares of this ETF. Most likely, I would be a seller of the shares bought in the ROTH IRA at over $20 and a buyer of another 50 shares at below $16. If I bought a second 50 share lot at less than $16, I would lower my price target for the first lot to more than $19. 4. Sold 1 HCA 7.5% Senior Bond Maturing on 12/15/23 at $104.77 (Stocks, Bonds & Politics: Junk Bond Ladder Strategy)(see disclaimer): I am no longer updating prior posts relating to the junk bond ladder strategy. I am in a liquidation mode for most of my positions, viewing most junk bonds as overpriced in relation to their risks and yields. I currently expect to exit this strategy without suffering a a net loss on the bonds, notwithstanding several defaults. One of the defaults was an AMR bond, which has recovered in price and is now selling over par value. FINRA AMR 2016 I have sold that one too. I mentioned this fund in a June 2012 post titled Volatility and Asset Allocation (first paragraph). I had just read an article in the WSJ about a new breed of mutual funds that take into account volatility of asset classes when making asset allocation decisions. ABRZX was mentioned in that article. 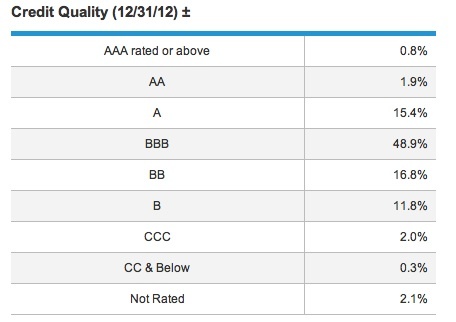 MSN Money shows the performance at 12.92 for 2010, 10.3% in 2011 and 10.57% in 2012. The fund is sold by Fidelity on a NTF basis with the load fee waived by the fund. ABRZX Summary - Invesco Balanced-Risk Allocation Fund Class A | Fidelity Investments I would never pay a load to buy a mutual fund. The fund is mentioned in Brendan Conway's "Focus on Funds" column in Barrons.com. Morningstar has a five star rating on ABRZX. The turnover is high. The MSN Money page referenced above shows a portfolio turnover rate of 282% which is not unexpected given the reliance on derivatives and the tactical allocation objective. This "conservative" allocation fund is rated five stars by Morningstar and uses a static asset allocation approach. The percentage weights will vary slightly over time but will be close to the following: 20% in gold; 5% in silver; 10% in Swiss Franc assets (e.g. Swiss government bonds); 15% in REITs and natural resource companies; 15% in "aggressive" growth common stocks (more aptly labelled value stocks in my opinion); and 35% in USD assets consisting primarily of treasuries (heavy into shorter maturities) and investment grade corporate bonds. Given the plunge in gold and silver prices, the fund has held up relatively well in 2013, in that it has not lost value through 3/15/13. The stock selections remain relatively constant over time too. Distributions are paid annually and are generally modest given the static allocation and relatively low selling activity. In 2012, the PRPFX paid a $.27 per share ordinary income dividend and a $.36 per share capital gain distribution. The reinvestment price was $48.37, representing a total yield at that price of only 1.3%. I have been reinvesting the dividends and have not sold any shares. My unrealized gain is close to $3,000. I view this fund as sort of disaster insurance. The fund did perform well in 2008 losing only slightly more than 8%. I will discuss the addition of yet another gold mining stock to the Flyers basket strategy in my next weekly post. I also added one last week to the LT basket strategy. I am buying into the gold mining sector in small amounts due to the smashed stock prices in that sector and their potential for a price recovery. The buying is unrelated to the Cyprus shenanigans or to any other recent event. Instead, the buying is simply the end result of a typical selection process for stocks to be included in either the Lottery Ticket Basket Strategy or the $500 to $1,000 Flyers Basket Strategy. The next post, scheduled for Monday, will be the monthly update on the regional bank and lottery ticket basket strategies.